Good people of stack. I am a programmer, but new to building my own electronics. I need to switch (3) 12v solenoid valves from the Arduino Micro. I see lots of chatter online, much that confused me greatly. The valve takes 12v \ 0.3A to close, not sure what inrush there maybe. I don't mind closing on the positive or negative side. Can someone give me a legible sketch of what would be required. This is the valve being used. You can use AO3400A as N-channel MOSFET, if you are OK with SOT-23 package. Or use IRLZ44N, which is many times more than enough for your load. Make sure you use flywheel diode D1, it is to protect MOSFET. I think 1N4148 would be enough. 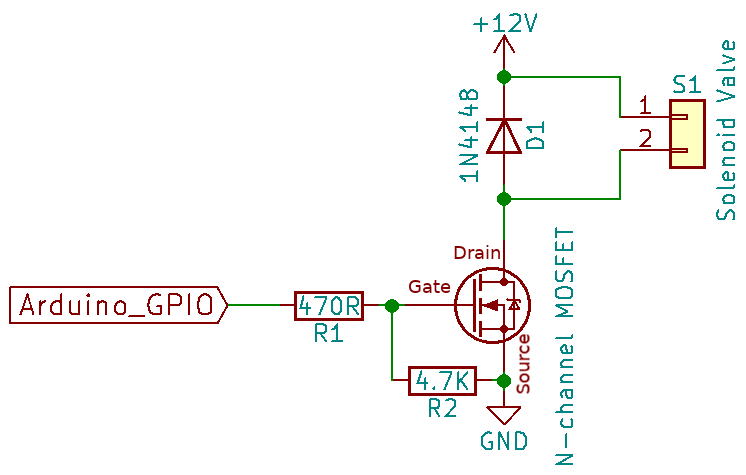 Connect Arduino's ground (negative of voltage source) with the GND shown in circuit. Not the answer you're looking for? Browse other questions tagged arduino solenoid-valve or ask your own question. 24 VAC Irrigation Valve Oscillation?